Inside Kakera-sensei’s home, the Turtles, disoriented and believing their sudden teleportation to be a trick of the Foot Clan, prepare to do battle. Leonardo, however, calls his brothers off, claiming he knows the rabbit standing before them. Leo and Usagi greet each other, having met three times in the past. Kakera then explains the score: that the Neko Ninja clan are after him for his mystical abilities. Outside, a sentry spots a pair of Neko Ninja before getting chopped down. The Turtles, Usagi and Gen give chase, successfully taking down one of the spies. The other escapes into the woods, unaware that Leo is secretly following him. Leo tracks him back to the Neko Ninja clan’s HQ, but decides to return to the village after spotting a number of guards. Inside, the spy reports the recruitment of Usagi, Gen and a Kame Ninja clan (the TMNT) to Kakera’s aid. Gunji declares that they will attack en masse tonight, as their superior numbers will be more than enough to take down their opposition. Chizu believes they should cut their losses before they lose more of their number, but Gunji refuses her advice, insisting that after this victory, full support from the Neko Ninja clan will be given to him. At the village, the local farmers begin preparing themselves for the attack Kakera predicts to come. Snooping around, Mike is astonished by all the walking, talking animals and begins asking Usagi, Gen and Kakera how they all evolved; a concept totally foreign to them. Gen, on the other hand, is more disturbed by the TMNT’s habit of traipsing around in the buff. 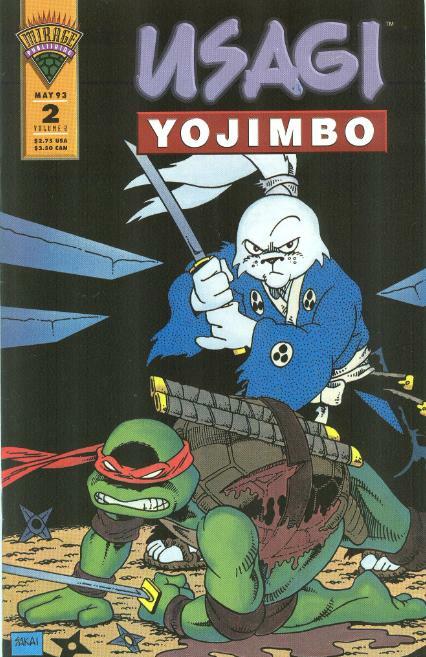 *This story is continued from Usagi Yojimbo (Vol. 2) #1. The story concludes in Usagi Yojimbo (Vol. 2) #3. *This issue also contained a back-up story, “Usagi’s Garden”, also by Sakai. The real action in “Shades of Green” gets underway with a very exciting middle section. Sakai has a talent for drawing “big brawls” and he often takes the opportunity to employ long panels that stretch from one end of the page to the other to facilitate the action. It’s one of his strengths, for sure, but I also enjoy how he never goes overboard with the violence in his battle sequences, either. Sword cuts rarely elicit gore unless it’s for dramatic purposes (such as Leo’s wound) and death is almost uniformly rendered as “cute” (the little skull and cross-bone thought bubbles). It’s one of the things that makes his comics suitable for kids, and really, in today’s world of “Identity Crisis”, “Ultimatum” and anything written by Kevin Smith, we need more comics that are fun, intelligent and suitable for all audiences. My favorite part of the issue, though, wasn’t the action but the one-page back-and-forth between Mike and Usagi. I think the sequence might have suited Donatello a bit better, is it focuses on the scientifically-minded Turtle and the spiritually-minded Rabbit trying to understand one another’s universe and “scientifically-minded” is more Don’s thing than Mike’s. Still, regardless of that, Gen’s punchline at the end of the conversation was great. 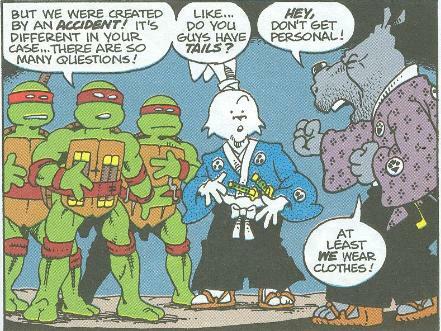 The Turtles mention that Leo had met Usagi three times before this story, thus accounting for all three TMNT/Usagi Yojimbo back-up strips published prior to “Shades of Green”. However, when I first read this issue, I hadn’t been aware of the existence of “The Treaty”, so I remember being very confused and scrambling to find out what this “missing” story way. Sadly, we’ve never had all three of the original crossover strips reprinted together in a single volume, the closest being Fantagraphic’s recent hardback anniversary volume, which only collects two of the three strips. “Shades of Green” continues strong into its center chapter with perhaps my only criticism being that Leo’s blood on the cover was recolored to look like mud for some reason, but the art is not altered to close his wound, making it look like Leo is oozing… “bile” from a gash in his shell. Not a Kevin Smith fan, I take it. Honestly, I love Smith's View Askewniverse films, as well as his article, Q & A sessions and podcasts (not to mention the short-lived Clerks animated series, which is about as kid-friendly as anything co-written by Smith gets), but I'm not too familiar with his comic book work. I have read all his Askewniverse comics (which are all nicely collected in the Tales from the Clerks book released a few years back), and think that they're funny in spots (particularly the Bluntman & Chronic story drawn by Michael Avon Oeming), and are worth picking up if you're a fan of the Askewniverse, but aren't really all that special. I hear that Smith's runs on Daredevil and Green Arrow were excellent, but everything else wasn't so hot.